after the second world war a painting arose that did not want to represent anything, did not want to reproduce anything that already existed in nature, but rather what is concretely played out on the surface itself, the visual fabric, which itself or its impact are shown. 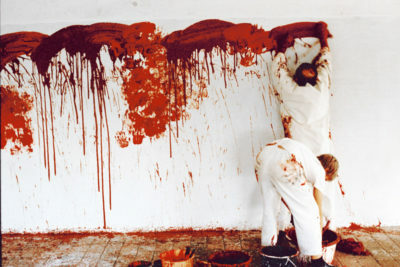 paint was not understood in terms of its colour tones but as a concrete substance, as paste or fluid that was smeared or splattered, giving rise to works determined by the gestures and motoric of arm and hand movements, it was scrawled, smeared, substances, fluids, colors were sprayed, hurled, poured etc onto the canvas. 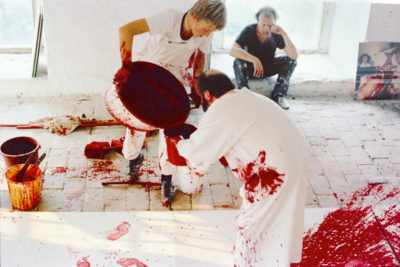 the viewability of the action performance was a key point of this art, because many painters produced their works in an actually felt state of (sensory) stimulation and self-divestment. the positive registering viewer can grasp the creation process formally. that concrete processes and their impact prompt an intensive sensory feeling by both producers and viewers, whereby a new effect is employed, realizable for the form, which is exerted by many objects and processes. this means a specific part of the spectrum of sensory experience is activated, it is extroverted. an elementary sensory feeling serves art. paradoxically, this perception of the elementary sensory is the result of a deeper, extended, sensitized and more conscious sensual comprehension. a more profound sensual understanding of our surrounds automatically brings with it a broadening of consciousness. art informel drew on the form and raised to consciousness those feelings which lurk only at the threshold of consciousness. it is first through art informel that the human becomes mature enough to consciously absorb a part of the sensory which was once registered merely subliminally, but could be evoked through channels of association, through dreams, memory, poetry and myth. the sensory intensity of imagery, provoked by the word, is an important component of the poetic (the lyrical). subliminal feelings are brought to consciousness through form, a retroactive registration made possible. this retroactive registering of what is initially subliminally registered is turned into an aesthetic event, rendered into form. an art arose which was directly interested in deeper psychic layers, for which it then acted as a mouthpiece, the psychic repressed and displaced metamorphosed into art. 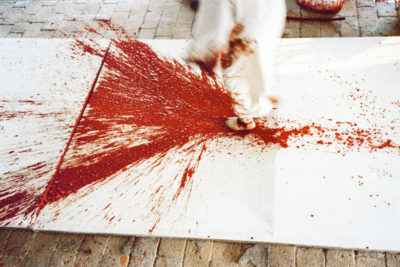 these undertakings, which emerged and were pursued almost simultaneously across the globe, naturally with a wide variety of accentuations, hung on the concept of tache, the stain or splash, whereas now, due to the distance to the movement tachisme, to the development of the entire spectrum of the informal practice we wrestle with the consequences of tachisme, which are today understood differently. one begins to gain an overview and sees that nothing unifies the painters of this orientation more so than the prudishly denied move into the “animal realm”. they are all linked by a lively interest in their own sensousness and libidinal impulses, in the inner reality. they all turn the unconscious outwards and bring it formally to consciousness. whereas the first tachist informal products still incorporated the breakthrough of repressed sensuality in the compositional patterns of old painting, this traditional formal constraint was gradually torn asunder later and then shoved aside, increasingly the sensory excitation became essential, which automatically registered these eruptions like a seismograph. the joy generated by involvement in the dynamic-destructive concrete event was thrust into the foreground. the pictorial was torn and destroyed. one wanted to cast off the shackles of the painting format, in isolated cases the consequences of tachisme made themselves felt. the wish to create what was coherently pictorially now sought to end in the ecstasy of the concrete, in reality. the innermost, perhaps not even recognized concern of the tachist lay in the dionysic-dynamic, lay in the abreaction apprehending the basic layers of the psyche that brings them to conscious awareness, the excitation, the upsurge of lust, the stripping away of inhibitions, ecstasy, the release of what has long welled up – they are to represent themselves. it corresponded to the character of the tachist to be a dramatic-expressive means of expression. action painting laid claim to a passage of time, it opened up a new dimension that inclined towards the theatrical event, to a dramatic happening. informal creating and rendering is turned towards theatre, where transposed it is placed, under different preconditions, in the first manifestations of the happening and finds its authentic impact foremost in actionism.